By all accounts, nature is good for you. But nature can also be bad for you: In some parts of the world, pollution levels are actually getting worse, despite everything we know about chemicals, car exhaust, and reducing our carbon footprint. In fact, more than 2,100 cities worldwide exceed recommended pollution levels, accelerating climate change. And air quality isn’t the only concern. Pesticides are still used by farmers worldwide to grow enough food for the expanding population, even though combined pesticide use has been proven to be more dangerous to humans. Pesticides are also known to hurt bees and their pollination processes, moving the EU to completely ban pesticides harming bees, a now-endangered species in the U.S. And livestock and the production of meat have an outsized influence on our environment, from water pollution to antibiotic intake. Nature is good for us, but what we’ve done to it has made it anything but. Technology, however, is looking for ways to undo — or limit — the damage we’ve inflicted upon our environment. While the outdoors is polluted, our indoor areas are at risk, too. Clairy, a company providing natural air purifiers fueled by plants, uses technology to reduce indoor pollution. The brand’s 2016 Kickstarter campaign attracted nearly 1,300 backers and more than $275,000 to fund the creation of its smart flowerpot air purifiers, which house tech units that combine with a fan to direct air from inside a building into the plant’s roots for detox. The purifier’s sensors track the quality of the building’s air, as well as its temperature and humidity levels, and send updates to the owner via its Wi-Fi module. 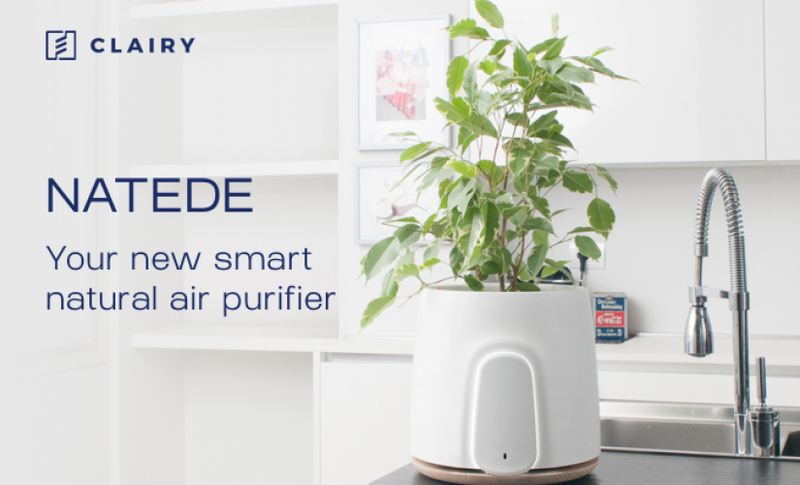 The company’s newest campaign aims to fund NATEDE, a smarter version of the air purifier. It uses advanced sensors and a photocatalytic filter to track air quality and eliminate waste and cost — the filter doesn’t need to be replaced. Testing has shown this smart air purifier eliminates 99 percent of bacteria, viruses, and fine particles, as well as 93 percent of volatile organic compounds. Like its predecessor, it uses an app to keep homeowners informed, and it can also connect to other smart devices. It’s already attracted more than 2,500 backers and more than half a million dollars. To reduce our reliance on animals — but still feed the world population — some companies are turning to engineered foods. Research institute New Harvest is helping universities create dairy products like milk and eggs, as well as meat, by using protein and fat molecules in place of living cells and replicating biological processes. Using genetically altered yeast, containing the DNA for casein, and cultured meat — which utilizes animal cells and multiplies them in petri dishes in utero — scientists can combine them with other nutrients and change their properties. Those cells can then be cooked and eaten like meat from an animal. This lab-driven method of farming is less resource-intensive than livestock farming, and it allows researchers to adjust the contents of the food to make it healthier. For example, New Harvest has made lactose-free milk for the lactose-intolerant, as well as meats with fewer saturated fats and eggs without cholesterol. Not only can engineered food reduce our impact on the land, but it can also help us eat healthier. It may sound ironic, but technology is also being used to reduce the damage tech inflicts on the environment. In an era when digital devices rule — 95 percent of Americans own mobile phones, approximately 75 percent own a personal computer, and nearly half have a tablet — the potential for environmental destruction is high. While we use the internet to do nearly everything these days, we still need devices to do that — and we quickly consider them obsolete and move on to the next one. Planned obsolescence also increased more than doubled in an eight-year span, meaning manufacturers are fueling this sense of finality. To combat this, Electronic Recyclers International (ERI) works with retailers like Staples and Best Buy to offer programs for recycling old electronics. By sorting and disassembling electronics, ERI ensures toxic chemicals — like lead and arsenic — don’t make it into landfills and drip or bury their way into the land. ERI’s recycling facilities recycle everything from batteries to routers to DVD players, and they’re dual-certified by e-Stewards and R2, meaning the brand keeps all reclaimed materials as reusable commodities. The brand recycles more than 250 million pounds of e-waste each year in North America and also handles data destruction, underscoring how efforts to keep our landfills free of electronics can also increase data security. While nature improves our health and happiness, the damage the environment has incurred can also hurt our health and happiness. Technology is working to limit the negative impact of our surroundings, and forward-thinking companies are investing in sustainability as a way of securing our future — and their own.